MENTOR, Ohio - The University of Michigan will go for its fourth victory in the 2014 American Solar Car Challenge with a car wrapped for beauty and airflow efficiency in Avery Dennison® MPI 1005 Supercast Easy Apply RS™ and DOL 1360 overlaminate, Avery Dennison Graphics Solutions announced today. University of Michigan solar car features Avery Dennison car wrap for 2014 American Solar Challenge. The Avery Dennison wrap film was installed on “Quantum” by TKO Graphix of Indianapolis, Indiana. The 2014 American Solar Challenge begins on July 21 in Austin, Texas and finishes in St. Paul, Minnesota. Since 2011, Avery Dennison has set five-year targets to make its products and processes more sustainable, and to make responsible business practices integral to all activities. "We're happy to partner again with Avery Dennison for the 2014 American Solar Challenge,” said Pavan Naik, project manager for the University of Michigan Solar Car Team. “Since we're racing Quantum, our most aerodynamic and lowest-weight solar car, maintaining the low drag profile as well as the small mass is important for race success. Thanks to the Avery Dennison vinyl wrap, we're able to maintain the super aerodynamic body while keeping Quantum looking flashy." 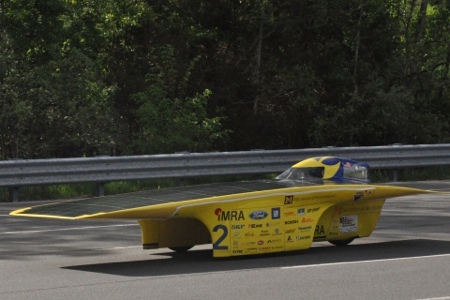 The University of Michigan Solar Car team won its third American Solar Car Challenge, in 2012, with Quantum, its eleventh custom-designed solar car. Quantum is a three-wheeled, 320-pound car that can reach top speeds of 105 mph. Avery Dennison MPI 1005 Supercast Easy Apply RS, a digitally printable pressure-sensitive vinyl that is repositionable and slideable, makes car wrap application easy. In addition, it features air egress technology, allowing air bubbles to escape during the installation process. Avery Dennison Graphics Solutions digital and opaque films are featured on buildings, in the street and around every corner; helping millions of brands and businesses identify, promote and inform the world around them. For more information about the American Solar Challenge, visit http://americansolarchallenge.org/. Follow theUniversity of Michigan: http://solarcar.engin.umich.edu/.